Outline: Mainly quoting Mark 2:1-12 and Col. 1:12-14. Mark 2:l - After some days, Jesus went into Capernaum again, and the news went out that He was at home. 2 - And so many people gathered together that there was not room enough for them, not even around the door; and He preached the Word to them. 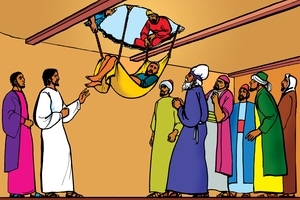 4 - (*) But when they could not come near Jesus because of the crowd, they took off the roof just above Him, (pause 3 sec.) and when they had made an opening, they let down the mat on which the helpless man was lying. 8 - And at once, when Jesus knew in His spirit that they were thinking this, He said unto them, "Why do you think such things in your hearts? 9 - Which is easier, to say to this paralyzed man, `Your sins are forgiven," or to say "Get up, and take up your bed and walk?" 11 -"I say unto you, Get up and take up your bed and go home." . . .
12 - At once the man got up, and took up his bed and went out in the sight of them all; so that they wondered greatly, and praised God, saying "We never saw anything like this!! (Pause 5 Sec.) cf.1:1 `Yes' Jesus has (authority) to forgive sins, `for He is' the Son of God. You, also, of 2:10 are a helpless one `at His feet.' And to you Jesus can say - with power - cf.2:5 "Son, your sins are forgiven!!" Col. 1:12-14: Giving thanks unto the Father Who has made us meet to be partakers of the inheritance of the saints in light: Who has delivered us from the power of darkness, and has translated us into the kingdom of His dear Son: In Whom we have redemption through His blood, even the forgiveness of sins. SOUND EFFECTS: Taking off tile roofing, music, crowds. Portion in bracket may be omitted if too long. GRN has recorded a version of this script in 43 languages and dialects. See full list.